It is unlikely that India and Pakistan will share any useful intelligence with each other as and when a joint anti-terrorism mechanism comes into existence. The Bharatiya Janata Party suspects an “American hand” behind India’s “unprecedented capitulation” before Pakistan on the issue of cross-border terrorism. Do we need an Education Commission to reform and standardise primary, higher, technical and medical education? The CBI today attached property and bank accounts of Ravi Shankaran, one of the prime accused in the naval war room leak case and a kin of Navy chief Arun Prakash, for his failure to appear before it for questioning. The decks have almost been cleared for setting up private universities in Haryana. The state Vidhan Sabha today passed the Haryana Private Universities Bill, 2006, by voice vote after Indian National Lok Dal members walked out of the House, saying that the law would encourage the “commercialisation of education”. 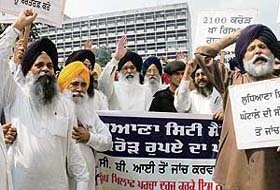 The suspended SAD and BJP MLAs, who comprise the Opposition, today staged a protest outside the Punjab Assembly demanding a CBI probe into the Ludhiana City Centre issue even as the Treasury Benches discussed important matters inside the House. SAD and BJP MLAs protest outside the Punjab Vidhan Sabha against the alleged Ludhiana City Centre scam in Chandigarh on Tuesday. The institute body of the PGI, the apex decision-making body, today approved the appointment of Dr Vinay Sakhuja, Head of the Department of Nephrology, as Dean of the PGI and Dr Amod Gupta, Head of the Dept. of Opthalmology as Sub Dean. The Punjab Government today came out strongly to justify Mr Parkash Singh Badal’s prosecution and even offered to shift the trial outside the state. BUSINESS: PMO disfavours AI-Indian merger? Will compensation bring back her 43 years? Rupees 10 lakh have been demanded as compensation for 73-year-old Sarla for being kept for 43 years at the Varanasi mental hospital. 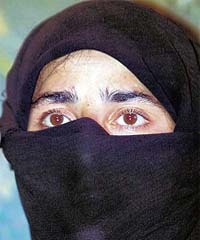 The designated human rights court of Varanasi will hear her case for release, rehabilitation and compensation tomorrow. For an 80-year-old, Gurcharan Singh is quite healthy, with ailments that accompany the ageing process not bothering him much. However, for the past few months, sleep has eluded him. WHAT ABOUT ME? 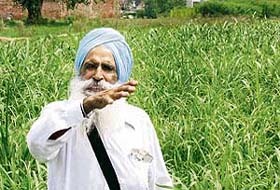 Gurcharan Singh points to his 1-acre field on the Jalandhar- Amritsar highway.